Nowadays, the chromosomal constitution of embryos can be examined prior to implantation. This usually happens on day 5 or 6, and the biopsied cells are sent for analysis to a highly specialised genetic laboratory. When talking about couples with a pre-existent inherited disease like e.g. cystic fibrosis, the method is called PGT-M (preimplantation genetic testing for monogenic disease); when we test all embryos for chromosomal misarrangements like trisomies or monosomies, it's called PGT-A (preimplantation genetic testing for aneuploidy, formerly PGS). PGT-A is much more common than PGT-M, and that is why the following text mainly refers to PGT-A. In 2015 and 2016, the Swiss voted by a very clear margin of 62% to 38% twice in favour of a liberalisation of reproductive medicine, allowing embryo freezing and embryo testing. The whole reproductive medicine community of Switzerland is happy about the public confidence. Having passed through a very comprehensive cantonal approval procedure, we are happy and proud to offer this technology to our patients from early 2018 on. Men and women possess 46 chromosomes each. A woman (left) has two X chromosomes, a man (right) one X and one Y. Even in young couples with normal parental chromosomes, the majority of naturally conceived embryos have an abnormal chromosome count, mostly because the female egg, which should give one copy of each chromosome to the embryo, may give two (leading to a trisomy) or zero (leading to a monosomy) instead. This phenomenon is due to non-disjunction of the chromosome pairs and increases exponentially with the age of the woman; it represents the biological background for the steep decrease in fertility and increase in miscarriages in women over the age of 35 years. The proportion of abnormal embryos, which is 51.8% in the age group below 35 years, increases continuously to literally 77.9% at 41-42 years. One needs to consider that only day 5 embryos (blastocysts) were examined; when testing embryos on day 3 like in previous years, even 90% would have been abnormal at 42 years of age. This underscores that waiting until day 5 alone eliminates many embryos with unsuitable chromosomal content, avoiding futile embryo transfers. 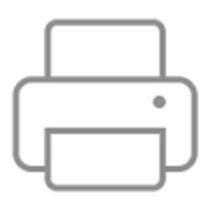 The high pregnancy rate of 60% in women aged 41-42 obviously comes at a price: only 59.6 percent could have an embryo transfer, while the other 40% - having spent more than 10'000 CHF - just received the sad news that no single suitable embryo had developped. PGT-A is merely a selection tool, which provides the couples an «open visor» and sometimes brutally honest information about the quality of their embryos. However, I am impressed time and again how Swiss couples rather assume the additional cost than having transferred embryos without the ghost of a chance. The «de-selection» of chromosomally abnormal embryos induced political and ethical opposition. Is it correct that PGS enables us to cold-heartedly eliminate embryos which could have lived? To find the answer, we need to look at another graph. In a study from New York, 1069 embryos with numerical maldistribution of chromosomes were examined. 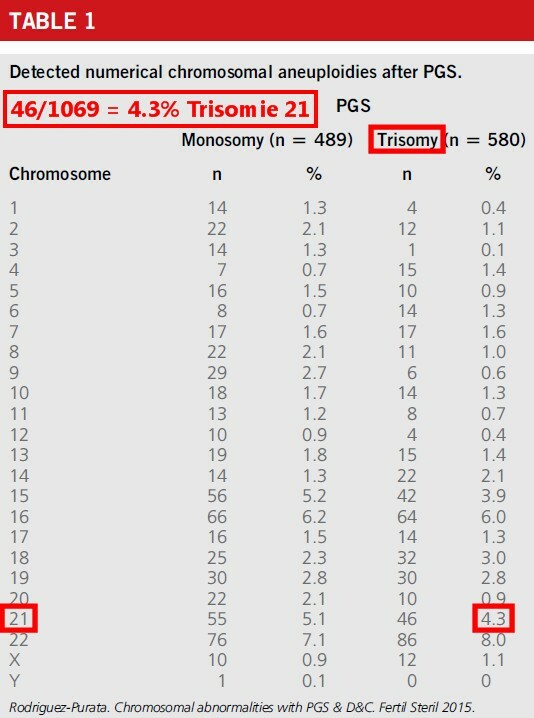 Only 4% had trisomy 21, the remai­ning 96% suffered from another of the 46 possible maldistri­butions (click on image to show the original data). Only trisomy 21 can produce living children (with different levels of handicap and malformations). All other 96% embryos were unfit for life in the first place. They would have produced a failed IVF cycle or, worse, a miscarriage which is painful both psychologically and physically, and makes the couple lose even more precious time. 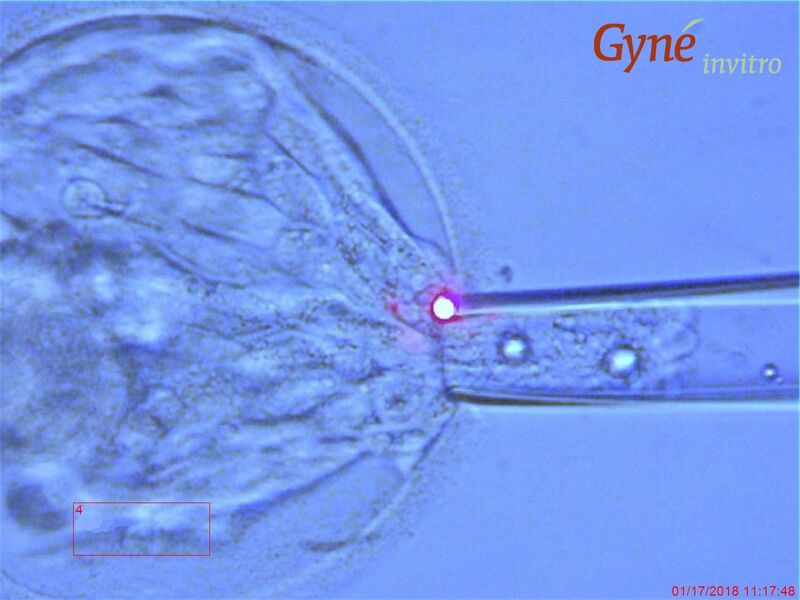 Image on the right: laser-assisted embryo biopsy (so-called troph­ecto­derm biopsy). The biologist removes 5 to 10 (from a total of 300) cells of the blasto­cyst, targeting the part which is going to be the baby's placenta. The proba­bility that the embryo will survive the biopsy and the subsequent freezing as well as thawing surpasses 90%. After biopsy, the minute piece of tissue will be expertly tubed and sent by courier to the specialised genetic laboratory of the leading Igenomix company in Spain or Italy. The results will be available in approx. ten days. Pre-implantation genetic testing with aneuploidy screening (PGT-A) is a promising and contemporary tool which is now also legal in Switzerland. It serves IVF couples in difficult situations and/or those whose time is melting away. Probably the strongest motivator will be past miscarriages. Not all IVF couples will resort to PGT-A, given the effort, complexity and additional cost, only those with a clear medical indication. 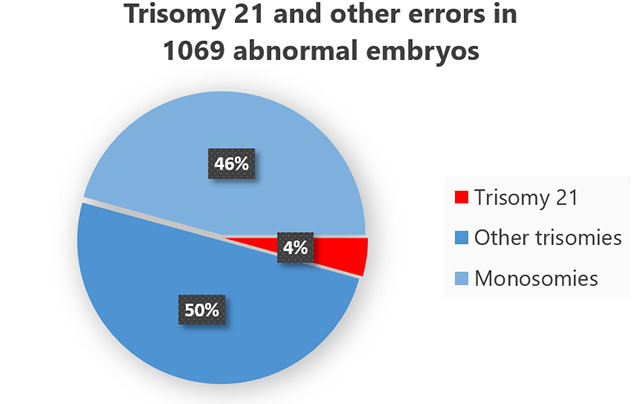 Over 95% of abnormal embryos on PGT-A are completely unfit for implantation or would have produced painful miscarriages, increasing time to achieve a pregnancy and extra economic cost. PGT-A improves the efficiency of difficult treatments and prevents miscarriages. In older women with little time, it can make the difference between having a child or remaining childless. The societal controversy on pre-implantation vs. prenatal testing for trisomy 21 will be dealt with on a separate page. As a principle, no woman should ever be forced to undergo a «trial pregnancy», i.e. being denied PGS and have to do prenatal testing at eleven weeks of pregnancy, with the possibility of consecutive termination of pregnancy.